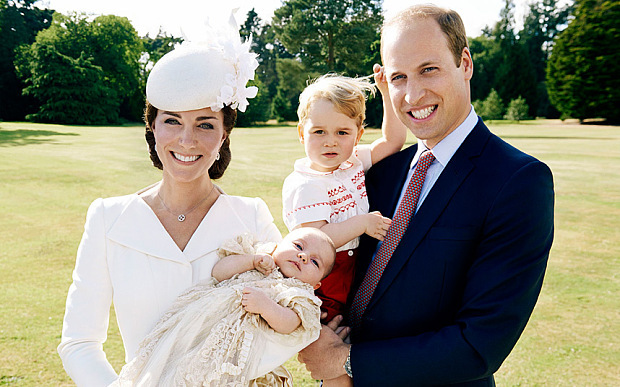 Fashion and celebrity photographer Mario Testino captures the christening of Princess Charlotte. The images ranged from a formal family portrait to close-ups of the infant with her mother, the Duchess of Cambridge, her father, Prince William, and her brother, Prince George. The photos were taken on Sunday immediately after the baptism at the Church of St Mary Magdalene in Sandringham, Norfolk, with the Queen present. It was a private ceremony but a nearby paddock was opened for wellwishers to watch as they leave the church, with the duchess pushing her nine-week-old princess in a vintage pram which the Queen had used for two of her children. It was the first time the family of four had been seen together in public. A Kensington Palace spokesman said: “The Duke of Duchess of Cambridge and their whole family had a wonderful day on Sunday and were delighted to share the special occasion with the thousands of people who came to Sandringham. They are very happy to share these photographs and hope that everyone enjoys them as much as they do.” The group shot, taken in the drawing room of the Queen’s private Norfolk residence, shows Prince William, Prince George, the Duchess of Cambridge holding her daughter and the Queen. Standing behind are Kate’s family – her parents, Carole and Michael Middleton, and siblings James and Pippa. The Prince of Wales, Duchess of Cornwall and Duke of Edinburgh are also in the picture. Mario Testino is a top photographer whose work has been featured magazines including Vogue and Vanity Fair, as well as museums and gallery exhibitions, he also created some of the most sensational images of the late Diana, Princess of Wales. Testino is a favourite of the royal couple and took their official engagement photographs in 2010, as well as marking Prince William’s 21st and Prince Harry’s 20th birthdays. See more photos below.